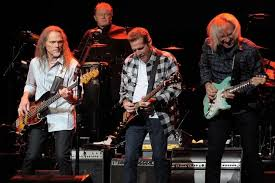 The “History of the Eagles” tour is aptly named. Theirs has been notoriously turbulent. Despite all the ballyhooing about breakups and acrimony, they never really went away. Thanks to radio formatting, their songs have been mainstays on everything from classic rock to easy listening. With its recent stop in Pittsburgh, they again proved why some consider them one of the best American bands e. Henley and Frey led off with an acoustic Saturday Night. Ex member Bernie Leadon was then introduced for the 1972 deep cut, Train Leaves Here This Morning. The band may not look their age, but they show it sometimes. They dedicated the first set closer Take It to the Limit to Randy Meisner. His crystal shattering signature high notes were aborted for a low register delivery by Frey. Leadon stayed on for most of the first set. Breaking the show into two parts lent itself to an uneven flow. The first 12 songs were mostly a 70s acoustic showcase with Leadon playing on almost every one. The usually explosive Witchy Woman was treated gently. The coffee shop vibe worked on desert ballads Doolin’ Dalton and Tequila Sunrise. But they didn’t start rocking until Heartache Tonight 17 songs in. From then on, it was the Joe Walsh show. The man familiar to law enforcement and hotel staff everywhere switched between a Srat and a Les Paul for a few of his songs including the collective sing-along, Life’s Been Good. In keeping with the format of the show, there were two encores; featuring Hotel California of course and the always eerie Desperado. After bassist Timothy B. Schmidt finished the super slow Love Will Keep Us Alive, Frey remarked, “We used to call that song Love Will Keep Us Awake. Well put for a show that was a little too heavy on the mellow.